Well the moves have finally happened and the dust is slowly starting to settle back to the ground. We have moved out of our 5th floor apartment in the 14th arrondissement of Paris to a house in one of the nicer suburbs to the west of the city. We also moved the contents of my house in the Netherlands down to Paris as well so the entire exercise has turned out to be a logistical nightmare. We started with the apartment – I have been there for 18 months and Jo has been there on and off over that period. Bearing in mind that it was all of 50m2 and accessed only by a staircase to the 5th floor it is remarkable how much stuff we (Ok,I) have accumulated. We collected the keys to the new house and did the usual listing of the state of the place with the estate agent on Saturday morning. 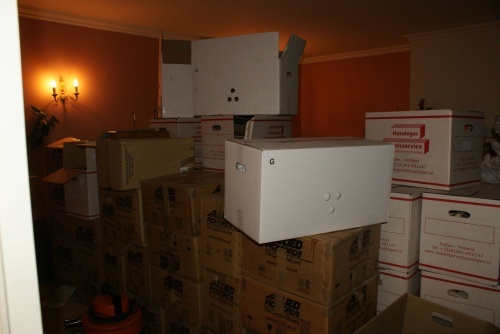 Then we rushed back to the flat and started packing into boxes. We had brought a number of boxes down from the Netherlands the previous week (courtesy of my last move with Pickfords, and my justification for never throwing anything out) along with a load of plastic boxes and bin bags. To say we were close with the estimates is an understatement (I will try better next time!) however we did manage to get everything packed. Saturday evening we decided we had time to get to the house and back in time for a late dinner so we walked into les Lauriers at about 9:30, somewhat exhausted. Sunday morning and I went to collect the hire van, a cute little 3.5m3 machine that looked more than adequate for the job. Our friend Josh turned up at 10 and we started the slop down with boxes and a slightly faster one back up running light Mike arrived later thanks to the usual problems on the metro line 13, just in time for coffee and croissants that Jo had found time to buy. Soon the van as brim full and Josh and I set off to the house for a swift decant. 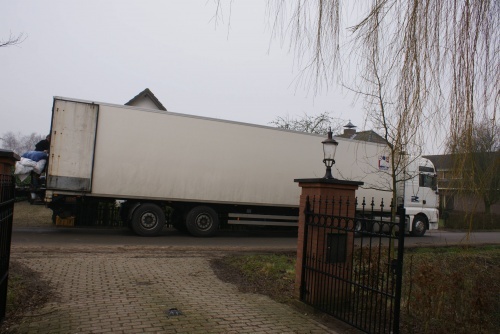 This was the point when I realised that the private driveway down to the house (sounds posh but it isn’t really) was only 2.6m wide, so not wide enough for a truck to pass. No matter. Back to the flat for load no.2 leaving only a ‘few’ things to take away the following day. Monday was a busy day at work (good timing there!) but I got back to find Jo had packed everything else and had cleaned the flat so effectively that I didn’t recognise it. However there was quite a lot of stuff still to go In fact, there was an awful lot more stuff to go And our timetable didn’t allow for a second trip back to the flat since this absorbed nearly 2 hours. Anyway with some extremely creative packing we finally loaded the Scimitar with more baggage than ever before and we waved goodbye to the flat. That night was spent in the new house on the bedroom floor with nothing more than an airbed to cushion the hard floor No matter, we were so tired it didn’t matter. Tuesday saw Jo working hard to arrange the most important room in the house (the kitchen of course) whilst I had a high stress day at work. I came back on the metro and RER for the first time, scooped Jo up and we drove up to the Netherlands, arriving at 0130 and falling into bed. The Dutch removers, having promised to be at the house at 0800 were ringing the bell at 0800, we were still struggling with the first coffee of the day. They set going on the house, packing everything into boxes and then switched to my garage at midday. Not an easy task although I had packed a lot of the 120m2 surface. They left at 4 with the head man Errie looking worried. He had estimated the volume at 60m3 and told me he that he thought it would be more than that….A lot more than that…. We crashed into bed that night for the last time in Asch with the alarm set for 6 Sure enough, just before 7am the following morning we heard the sound of a large truck outside the window and looked out to see…a huge semi-trailer…To say I was surprised is a slight understatement – and worried since this thing was incapable of going up this drive and very unlikely to be capable of getting very close to the new place. However a problem for later. 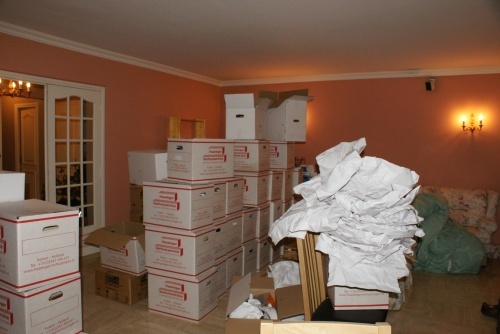 The day started by loading the house stuff, an easy exercise after the boxing that had taken place the previous day. At about 11 they started on the garage. And finished at about 4. Much of the garage consists of hugely heavy objects in inconvenient packages and includes engines, machine tools and welding equipment, all of which tried the energy of removers. They got around the problem of a 70m gravel drive by bringing a small trailer along and using one of their cars to shuttle back and forth between the garage and the truck. Quite neat. When I discussed the access problems at the other end with the remover he had the idea to add the trailer to the contents of the truck to repeat the process. So it was duly loaded with its own load installed too. They loaded the last 2 objects (the deep freezers) and closed the doors – just – on 85m3 of stuff! They set off immediately and we set off soon after a last clean for another 500km return to Paris u but at least our new route no longer involves the peripherique. Friday morning saw us up early (again! And for anyone who knows us, early mornings are not really our sort of thing) and waiting for Errie the Dutchman who appeared on the dot of 8 for his cup of coffee. Hardly surprisingly he had not parked the truck in the square, nor even in the next road over but in the main road 500 m or so away. We discussed the problem whilst we drank coffee & waited for the French unloading team from a local removals company to arrive. Errie felt that he could get into the square I was trying to remember the Dutch for “not in a month of Sundays”. When the 2 French guys turned up, the agreed. Errie then backed the wrong way up the street leading to the square and proceeded to open the back doors of the truck despite blocking dozens of school run drivers. The French were equally unimpressed with that too and so was I. I had visions of our first day in the town being marred by interviews with the local gendarmerie…not good! Eventually a couple of the locals were persuaded to move their cars so that Errie could park the truck closer to the house – now only 250m away! The 2 French guys now materialised into 4 with the largest box van they could find that would go down the private road. And so commenced the move, transfer from big truck to little truck sitting back to back, tail lifts touching, followed by little truck backing down the lane and transfer by hand or trolley into the house. The final load was wheeled in at 4 in the afternoon and everyone had gone by 5 leaving us in a world of cardboard boxes. Since then we have (mostly Jo, actually) carried out a massive de-boxing exercise and now have a salon with only a few remaining boxes to deal with. My garage and office are slowly getting better and there is a feeling that life is getting calmer. Hopefully the next move will be simpler and involve less individual steps.